What’s better than a brand new Audi with AT&T LTE built in? A brand new Audi with LTE that has an NVIDIA software system to back it up. CES 2014 is shaping up to be the battle over your dashboard, and NVIDIA is looking to make their mark by bringing their Tegra experience and Visual Computing Module to Audis this year, and hopefully more cars down the road. Audi is looking to find the car of tomorrow’s dashboard and has turned to NVIDIA to help them realize it. The 12.3″ high definition display is powered by Tegra 3 and is capable of running the necessary gauges for the car alongside maps and other pertinent information at the same time. The other innovation NVIDIA and Audi are getting together to work on is the 10.2″ SmartDisplay, dockable-tablet that integrates with the car’s video and audio systems. This tablet has a full access to Google Play for all the media you would ever need to keep the kids quiet on that long road trip. All of this is brought together by NVIDIA’s Visual Computing Module which gives automakers like Audi a stable system to implement in their vehicles. The VCM is powered by an NVIDIA Kepler CPU with a dedicated video and audio processor as well. Combine that with the news that Google is working on an Android port for cars and the future of dashboards is getting pretty exciting. LAS VEGAS—CES—Jan. 7, 2014—NVIDIA today announced that three newin-vehicle systems powered by the NVIDIA® Tegra® Visual ComputingModulehttp://www.nvidia.com/object/visual-computing-module.html(VCM)will soon begin shipping in Audi’s vehicles. · a high-resolution digital cockpit with unprecedented, vivid 3Dgraphical displays. The Tegra VCMs powering these systems are highly flexible platforms,incorporating an automotive-grade NVIDIA Tegra mobile processor with anNVIDIA 4-Plus-1™ core CPU, a multi-core GPU and dedicated audio, video andimage processors. The Tegra VCM uniquely enables carmakers to slide the most currentprocessors into their electronics systems, allowing for faster evolution ofin-vehicle systems as newer hardware becomes available. This modularitydramatically narrows the technology gap that has traditionally existedbetween consumer electronics and the long development lifecycles ofin-vehicle systems. Building on Audi’s modular infotainment platform, known as MIB andintroduced in 2012, the automaker’s next-generation platform will beginappearing in next year’s models. The award-winning Audi Connect system brings an unprecedented level ofintegration into the car, enabling Google Earth and Google Street Viewnavigation, as well as real-time traffic and parking information – allaccessible via speech and handwriting recognition. The newest system,powered by Tegra 3, will more than double the performance of itspredecessor. Audi also launched a new category of mobile device, known as a SmartDisplay. This multimedia computer powered by a Tegra 4 processor isdesigned for rear-seat use, yet seamlessly integrates with the car’s audioand video systems. It has been hardened to withstand a wide range ofoperational conditions, from -40 degrees Celsius to 80 degrees Celsius, andto withstand the shocks and vibrations that driving conditions can present. Featuring a 10.2-inch screen, the dockable tablet runs the latest versionof the Android operating system, with full access to Google Play and theAndroid App Store for hundreds of thousands of e-books, music, games andfilms that can be enjoyed by passengers in the car. 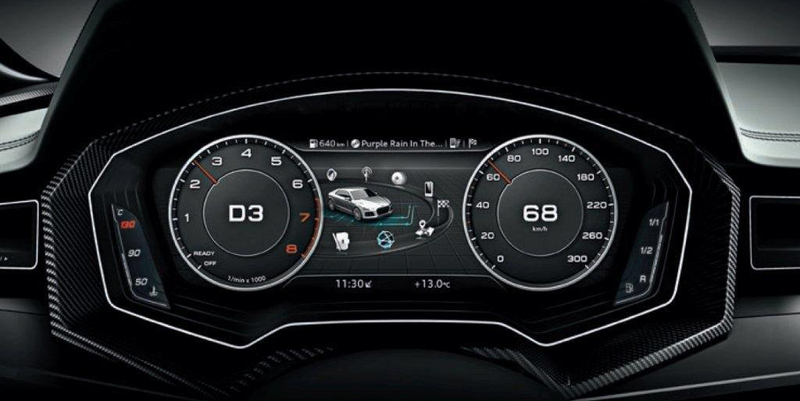 Additionally, Audi unveiled a new, fully digital instrument cluster,powered by Tegra 3. The virtual cockpit – which will first appear in the2015 Audi TT sports coupe – delivers clearly presented information to thedriver on a 12.3-inch, high-definition display. The virtual cockpit features refined digital gauges with smooth needleanimation, as well as beautiful 3D maps, delivering an elegant, informativedisplay. Drivers have the ability to configure the dashboard controls basedon their personal preferences. The power of the NVIDIA Tegra for automotive applications will bedemonstrated in NVIDIA booth 30207 at the 2014 International ConsumerElectronics Show in Las Vegas, Jan. 7-10, in the South Hall of the LasVegas Convention Center. Today, there are more than 4.5 million cars on the road powered by NVIDIAprocessors, including the newest models from Audi, Volkswagen, Skoda, andSEAT. Find out more at www.nvidia.com/automotive.